Calorie Counts in Glorious One-Pot Meals - Elizabeth Yarnell, naturopathic doctor specializing in food sensitivities (MRT, CLT), health, diet and nutrition speaker. Hi Mary! You’re right that those calorie counts listed for Glorious One-Pot Meals would seem awfully low if they applied for the entire meal! Usually calories are listed per serving on product boxes and in recipes, and it is the same for Glorious One-Pot Meals recipes. Each recipe represents two servings, but the calorie counts are per serving. But I’ll confess that I’m not a big fan of this kind of nutritional counting for many reasons and I really resisted including the counts in my cookbook (I lost that fight, obviously). Not only do I believe that a whole-foods-based diet is healthier than a low-calorie diet, but I think that the whole “calories-in-vs-calories-out” philosophy of dieting is a flawed theory of weight loss. But if we know that obesity can be viewed as excessive inflammation, then we can see that obesity may be less about how much we’re eating, and more about what we are eating. Additionally, if you do any substituting in the Glorious One-Pot Meal recipe from what is written, as I encourage the reader to do on almost every page of the cookbook, then those calorie counts will change anyway. While I have received many testimonials from readers enthusing about how eating GOPMs have led to weight loss simply because they are eating more whole foods and veggies, the best way to identify the foods that are inflammatory for each of us is to identify our sensitivities by taking the Mediator Release Test (MRT). It’s truly the gold standard in determining which foods and chemicals/additives in our foods are inflammatory for your unique body. If weight loss is your goal, the MRT and LEAP dietary therapy can help you make the least inflammatory GOPMs for yourself. Sometimes the MRT results can be really surprising. For myself, I learned that lettuce causes inflammation in my body. Lettuce! How ridiculous is that?! But I can clearly tell that eating lettuce causes me to inflate a dress size overnight. If I eat some avocado with that lettuce, that’s two dress sizes up. Its crazy! However, once I stop eating my inflammatory foods the inflammation will recede, regardless if I am reducing calories or not. It’s a new paradigm in weight loss. I’m happy to offer my readers a free initial phone consultation if they’d like to know more about food sensitivity testing, the MRT and LEAP. Just fill out this form to get started losing weight – without counting calories! I have had MS for over 20 years and so greatful it has stayed at bay for the last 12 years or so. 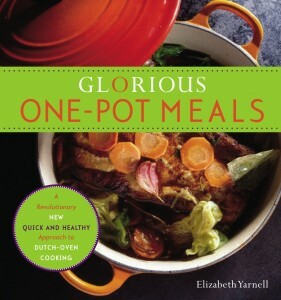 My husband and I eat about 2-3 one pot meals per week and have done so for the last 8 years and we love them. I tell people about the meals and Dutch oven all the time. I love, love, love the flavor and convenience! Per my question about calorie count, you answered that each meal is about 2 servings. Is a serving size about 1 cup? Thanks! P.S. I know you are not a fan of calorie counting just trying to record what I eat in my food log and keep track of daily approximate calorie in take. I’m beyond pleased to learn that you and your husband have been enjoying GOPMs for 8 years! I believe GOPMs are a great option for couples as it makes it easy to eat wholesome, varied meals without a ton of leftovers. You have made my day! Thank you. And I get it: the calorie counts can be helpful, which is why I ended up including them in the cookbook. So let me clarify: if you are filling a 2-quart Dutch oven with ingredients for two people’s Glorious One-Pot Meal (as indicated in the recipe), then one serving would be equal to one-half of the cooked pot of food. If you are increasing the yield to feed 4 people and cooking in a larger Dutch oven, then one serving would be 1/4 of the finished pot of food. You could also look at the ingredients list and divide that by two to come up with the serving sizes. Thanks for being a fan! I’m so excited that 2019 will be the 10th anniversary of the Random House version of GOPMs! I’ll be doing a lot during the year to celebrate, so definitely subscribe to this blog to hear all about it!